Nothing allows me to forget about the cold temperatures of winter quicker, than spotting the surface rings from trout feeding on Midges or Blue Winged Olives. It’s not an everyday occurrence by any means, but when it happens, it feels like someone turns the heat up a few notches, and I’m instantly warmed head to toe. When we think about hitting trout water during the winter months, most of us don’t typically think about fishing dry flies. It’s true that day in and day out, most anglers will find their nymphs and streamers to be much more productive, but every once in a while, when luck is on our side, we can find ourselves smack dab in the middle of a winter hatch, with trout rising all around us. It’s during these special two hour windows of trout fishing, that the winter can provide us some of the most rewarding catches of the year. That is, of course, if we decided to bet against the odds, and pack our dry fly box. I’ll gladly give up catching numbers of fish during the winter, in exchange for taking a handful of fish on the surface with tiny dry flies. The trout don’t even have to be all that big either. They just need to give me a pretty rise and tug my line a few good times. I guess a lot of it has to do with the fact that I believe hatches in the dead of winter, are like rare gifts handed down from above. Gifts that should always be full appreciated by the fly angler, otherwise they may decide to not show up again until spring. Late morning through the afternoon is the time of the day when I find midge and blue winged olive hatches to appear the most, and it’s often the bitter cold days with drizzling rain or snow flurries when the hatch decides to show up. 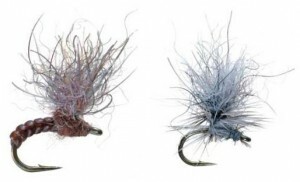 Below are six proven winter dry flies and emergers that have served me well over the years. All you need to do is downsize your tippet and rig them up, with a standard dry fly/dropper rig. I’ll never forget working a pod of rising fish during the winter five or six years with a first-time client of mine. We had managed one trout right off the bat, but after that, the trout wanted nothing to do with us. I tried a half dozen patterns with no success, when my client reached into his box and handed me a size 22, Cannon’s Snowshoe Hare BWO Emerger. It was the first time I’d seen the pattern before, and it honestly didn’t look all that appealing to me because it carried the wear of being stowed in a fly box for several years. That all changed of course, when we took three consecutive trout immediately after tying it on. Cannon also ties the Snowshoe Hare Midge Cluster, which is a phenomenal midge pattern for trout as well. Stock some in your box and break them out when you find yourself dealing with picky trout. I promise they won’t let you down. 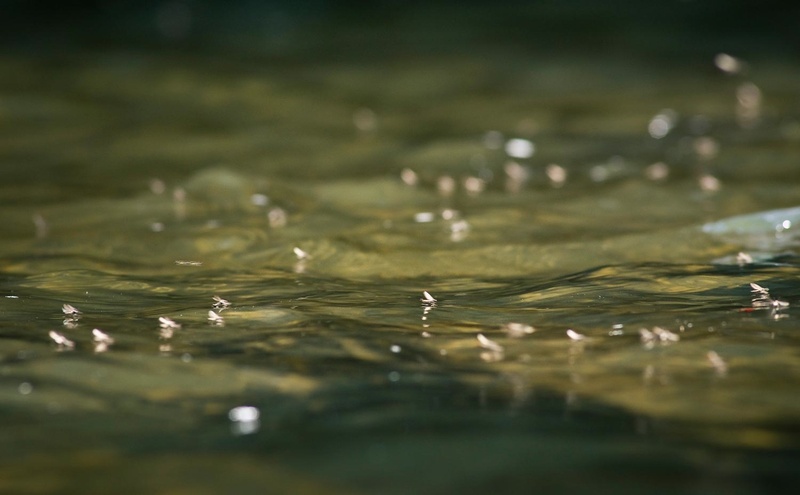 With the popularity of parachute dry flies over the years, many of us have lost sight of the trout catching capabilities of Catskill-Style dry fly patterns. A good buddy of mine proved to me a number of times over the years, the value of always having a few of these guys in fly box. I can recall clearly being out fished by him five to one during BWO hatches, when I was using the latest parachute offering and he was fishing a size 22 old school Castskill BWO. Sizing them down, they can work wonders for taking trout that have grown weary of the parachute silhouette, and they float high and are also pretty easy to see. There’s a reason every trout selection of flies always seems to have a couple Griffith’s Gnats in it. They imitate midge clusters and trout keep midges on their food menu every day of the year. Much like the Catskill-Style dry flies, I think many fly anglers write off Griffith’s Gnats as uncool and outdated. If you believe that, open the fly box of any fly angler you know that regularly catches trout, and I bet you’ll find at least a few of them in their box. 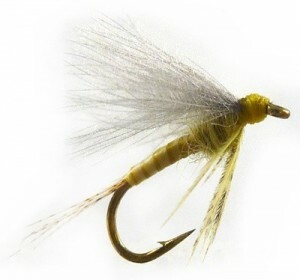 When trout are sipping on midges, or are really spooky, a well presented Griffith’s Gnat will usually get the job done. I recommend the Hi-Vis version for those of you out there that have a tough time seeing tiny dries on the surface. 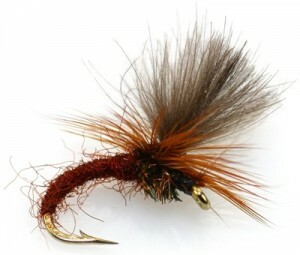 I hold the highest respect for Rene Harrop as a fly designer. The majority of his patterns are fish catching machines, and one pattern particularly, that I’ve grown very fond of fishing during BWO hatches, is his Harrop’s CDC Biot Dun BWO. Drop it 20″ off the back of a dry fly and you’re almost guaranteed to catch fish whether you’re on a finicky spring creek or a heavily pressured tailwater. If you tie, I also recommend ribbing the biot with an extra-fine pie of copper or gold wire. It adds a touch of extra segmentation look and flash in the water. Don’t forget to swing the baby at the end of your drift. That’s when the trout will really eat it up. If you like fishing tiny flies, the RS2 has probably become a staple for you on the water. It’s sparse profile can effectively imitate various baetis and midge species, especially when the size is matched correctly to the naturals on the water. Most of the time, trout find it hard to turn a cheek to this pattern. 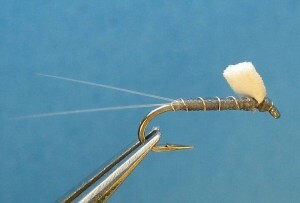 I’ve personally been fishing the RS2 Foam Wing Emerger this winter with great success. The razor foam that’s incorporated in the pattern, helps keep the fly drifting right in the surface film. Keep an eye out for the Baetis Foam Emerger as well, which utilizes the same type of foam but wears the more traditional bwo colors. It took me a while for the Klinkhammer style dry fly to catch my attention, and it was actually Louis, who really got me started fishing Klinkhammers. I eventually got tired of him whacking fish standing right next to me in the river, and I finally asked him if he would give me one to tie on the end of my line. Klinkhammers are unique in the fact that the majority of the pattern rides below or in the surface film. 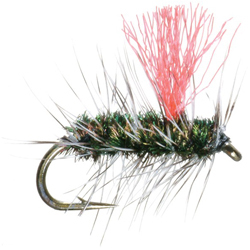 Think of them as the hook riding down at and angle in the water as the fly drifts, like an emerger struggling to hatch into an adult. Klinkhammers make great searching patterns when there’s not a hatch in progress and have proven to coax trout to the surface for me when all other patterns failed. I always keep a half dozen 20-22 size Klinkhammers in my box during the winter months. That’s my list of the six dry fly or emerger Patterns that I always Carry with me during the winter. Drop me a comment and let me know about some of your favorites. This entry was posted in Fly Fishing Tips & Technique, Fly Tying, Trout Fishing and tagged 6 Proven Winter Dry Fly Patterns, best bwo patterns, best midge patterns, best winter dry flies, fly fishing blog, Gink & Gasoline, Gink and Gasoline, Kent Klewein, Louis Cahill, top winter dry flies, winter dry fly patterns, winter fly patterns, winter trout fishing tips by Louis Cahill. Bookmark the permalink.